Contagious ovine digital dermatitis (CODD) is a highly infectious disease in sheep that causes great pain and severe lameness. 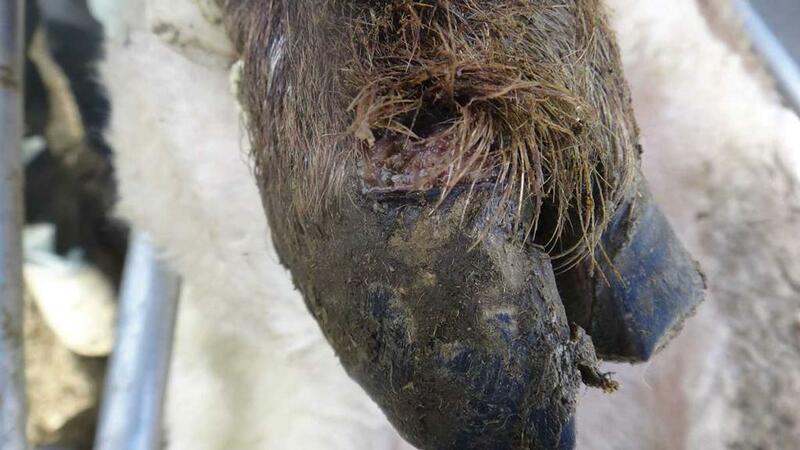 The earliest stages of a CODD lesion - ulceration with or without hair loss at the top of the hoof. Over a number of days, the lesion progresses downwards towards the toe, under running the hoof horn capsule. In many cases the whole hoof horn capsule may fall off. To ensure correct diagnosis and treatment, it is essential to seek veterinary advice as soon as CODD is suspected. "Ideally, purchase sheep from flocks that are free of CODD. Not all sheep with CODD are lame, so you should quarantine all purchased and returning stock and individually examine all feet for CODD lesions on arrival. "Treat as advised by your vet and isolate, or return sheep to the seller as appropriate. Bio security and farm hygiene programmes are vital to limit the spread of this infection." Treat promptly to reduce contamination. Ideally isolate affected sheep in a separate pen or field. This will help treatment and reduce disease spread. Individually treat sheep with long-acting injectable antibiotics within three days of onset of symptoms. Research has shown amoxicillin and macrolide to be effective but seek veterinary advice. Dr King says: "Prompt use of the correct antibiotic at an accurate dose and in the appropriate manner is vital. "Repeat treatments may be required and a topical antibiotic applied to the surface of the foot will help prevent disease spread. "CODD is extremely painful, so consider using an anti-inflammatory to help relieve pain and speed recovery." CODD is infectious so always clean and disinfect hands, gloves and equipment between handling sheep feat. Handling areas and lameness pens should also be cleaned and disinfected after use. A successful lameness control plan should include a combination of prompt identification, diagnosis and treatment, bio-security measures, farm hygiene, culling and vaccination against footrot. "The footrot vaccine has been shown to be effective in reducing cases of CODD and footrot, but it is important to remember that using the vaccine does not mean that you can forget about the rest of the plan," says Dr King. There is an urgent need to preserve the effectiveness of our most valuable medicines for future generation. Always plan your farm's first-line antibiotic treatments for CODD and footrot with your vet. "This can save you considerable time and money, as well as being important in responsible antibiotic use. "Use as little as possible, as much as necessary. If treatments do not appear to be working, report this to your vet immediately." Topical foot bathing antibiotic solutions is not effective for the treatment of CODD and so is not recommended. The effectiveness of non-antibiotic foot bathing solutions has yet to be established. Evidence shows that whole flock treatments with critically important antibiotics, that is antibiotics which are important to human medicine, are not any more effective that other lameness control practices and are not recommended.